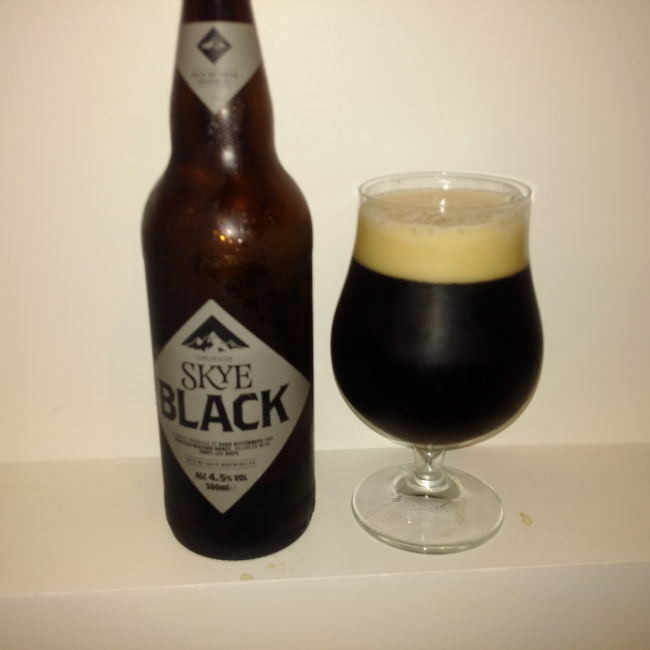 From the Isle of Skye Brewing Co in Scotland comes their “Skye Black” a scottish ale. The beer pours a deep brown with ruby tinges and a tan head. The aroma is of roasty malts, coffee, sweetness and a hint of earth. The flavour is of burnt malts, coffee, chocolate, mild ash, some fruit notes, honey and a hint of bitterness. The alcohol content comes in at 4.5% with an IBU of 18. This was a very enjoyable beer and I was glad my Mom brought it back for the UK. Commercial Description: The colour comes from dark roasted barley, balanced with just the right amount of sweet, rolled oatmeal. We mill both right here in the brewery, giving us complete control over flavour and freshness. The true taste of malt shines through, balanced by the sweetness of pure Scottish heather honey.